If you’re a senior bound to stay in an assisted living community or nursing home, be sure to be prepared moving onto an entirely new chapter in their life. This transition, could be stressful and challenging especially on the disposition of your real estate properties. 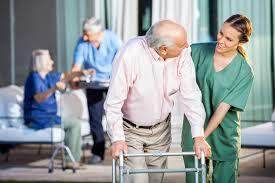 There are instances that you may need to sell house fast in order to move to a suitable nursing home. Having a close relative, say a son or a daughter, whom you can trust should help ease the stress considerably. But just the same, you need to take deliberate steps to ensure a smooth changeover of your house and other valuable properties. The ideal situation would be for you to have been proactive and already established an estate plan. This plan, of course, needs to be periodically reviewed as it not only takes care of the financial implications of inevitable life changes, such as moving to a nursing home. Necessarily, it also has to involve immediate members of your family. With whom the state of your relationship, cordial or otherwise, could change over time. As we move into old age, the imperative for us is to discuss with our family members the disposition of our properties and finances in case we’re debilitated or our decision-making is seriously impaired. Preparing for our winter years and prior to staying in a nursing home. We should ideally have already set and reviewed our health care proxy, power of attorney and will. It must be ensured that our beneficiaries are in order on all our policies and accounts. Involving trusted members of the family is also essential because selling your house fast could be the most viable option to pay for you to move to a nursing home. Some nursing homes require their residents to use up all of their financial resources and available assets to cover expenses. Medicare benefits, in this case, only kick in after all your assets are used up. Liquidating your assets, particularly to sell house fast, could be a real challenge though. The going is even tougher if you don’t have a well-prepared estate plan. Like the estimated over 120 million seniors across the U.S. who don’t. In your senior years, engaging the real estate market may already look daunting enough. To achieve the optimal conditions of a sale, your house has to be spruced up and staged well in order to draw serious buyers. Real estate investors like House Sold Easy can ease this pressure on seniors moving into nursing homes. There is no need for you to undergo the physically and mentally demanding, as well as costly, tasks of getting your house market ready. As property investors for more than 10 years, we have grown a professional staff who empathize with seniors’ specific needs. One of our senior buyers could do a quick tour of your home and promptly estimate its fair price. Get the ball rolling on the sale of your house as-is. Call us at 636-525-1566 today!